Can't afford the expensive electric toilet seat warmer? This is your solution! A specially woven fabric that is soft, warm and cozy to the touch. This material is stain resistant. Once you put it in water and add soap, there is not much scrubbing to do. 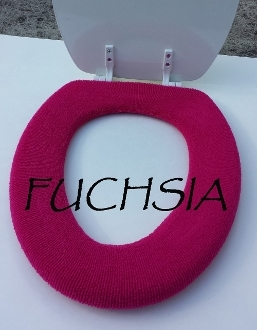 It is made to fit perfectly on your round or elongated toilet seat. More importantly, it accomplishes the goal of making your trip to the bathroom more pleasant. WASHABLE!!! Do you dread sitting on your toilet seat especially in the winter months? Do you experience discomfort or skin soreness around your bottom and thighs during the cold winter months due to long exposure to your cold toilet seat? Do you sometimes have to pad your toilet seat to summon the courage to sit? Do you sometimes wince before you sit on your toilet seat knowing the brrrrr…will be your next reaction? Do you sometimes hold it as long as possible so you won’t have to sit on your toilet seat especially in the winter months? No more cold toilet seat—not in winter, not in summer, NOT EVER! The toilet seat warmer can be hand or machine washed (hand wash highly recommended). This toilet seat warmer will shield your body from cold related injuries due to prolonged chilly toilet seat exposure. It will substantially reduce freezing sensations from cold toilet seats and bypass the cold, providing you with a warm toilet seat all year round. You will appreciate the difference when you remove your toilet seat cover to wash and have to seat back on your cold toilet seat. Copyright © 2014-2019 LifeLong Needs. All rights reserved.